I never wanted to do missions. The thought of evangelism scared me so much. I’m an introvert, so being a follower and in the shadows is where I’m usually at. I admired and respected those who went overseas long term, but was thankful that’s not where the Lord was calling me. My plans were simple- graduate nursing school, get a good job, get married, and have a family. I didn’t think I would need or want anything else in life. I graduated nursing school and got a good job as a pediatric nurse, so everything was lining up. Despite all my friends around me marrying and having babies, I had yet to find anyone. Nonetheless, I still thought I was living a good life, I had an apartment to myself, I would go on a couple trips a year with friends, and if I wanted anything I would go out and buy it, no problem. Something was missing though. I would lie in bed and just feel like there was something more, but I had no idea what that was, so I kept going on with life. I then started drifting from God, and did some things I’m not proud of. This downward slope went on for about 2 years. After hitting rock bottom, I started climbing back up and renewing my relationship with the Lord. I decided to go on a mission trip with my church to help me refocus. I have a passion for children, so I decided to go to Monterrey, Mexico, and serve in an orphanage for a week with my church. This week was just what I needed. My heart was whole again and I became alive. I was stretched out of my comfort zone in so many ways. I poured my love into the children and grew to love my team members like family. Coming home I was frustrated, I felt like there was more I should do, but I didn’t know what it was. So I again sat and waited, planning to go on another trip the next year. It was during this time that I was getting restless at work. I had been there for about 6 years and I felt stagnant. I had applied to another children’s hospital, but that didn’t work out, which I would later find out had God’s hand all over it. My manager approached me a little later and asked me to become one of the charge nurses. I did not want to, for the reasons I listed earlier. I was not a leader, not good enough at my skills, and didn’t have enough knowledge. There were a lot of older and more experienced nurses who worked there, so I figured they would be a lot better. She continued to push and plead though, and my desire to please people won over, and I told her I would do it. I felt sick with fear, just praying that God knew what He was doing. He of course did. He was preparing me for my future role. Charging allowed me to get out of my comfort zone and gain confidence in my skills as a nurse. Everyday before work I would pray for God to give me the knowledge and the ability to lead my nurses. I would run into conflict and challenging situations all the time that made me wonder why I was doing this. Shortly after I got back from Mexico, I was sitting at lunch with my friend and I told her about my desire to go back on another mission trip. She asked, “Why don’t you do a medical mission trip?” My first instinct was “no way!” I didn’t feel like I knew enough about nursing to do this. I hated it, but I knew as soon as she said it I would be doing it. Once again, God was speaking to me through my friend. 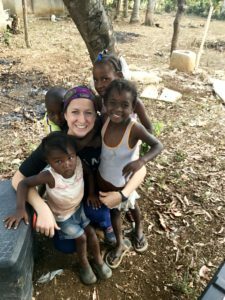 I sought out different medical mission trips my church was offering and my nerves started turning into excitement, realizing this is exactly what God wanted me to do. I ended up in Cambodia doing mobile clinics in the villages of Kratie. This week was life changing. It was a crazy feeling of feeling so comfortable and so happy and not ever wanting to leave. This is coming from a homebody; someone who doesn’t like to be gone from home longer than a week. Being out in the villages treating the patients gave me so much joy. I realized I knew a lot more than I thought I did. I shared the Gospel for the first time, and the more I did it, the closer to God I felt. I was depressed when I came home. I had the feeling of wanting to go on a mission trip every day of my life. I didn’t think I could wait until the following summer, so I started looking into midyear mission trips. I didn’t feel God leading me in any specific direction, so I let that idea go. The leader of my Cambodia trip approached me about co-leading the next trip to Cambodia with her. By then I was like “okay God, obviously you’re leading me somewhere. I’m not sure where yet, but I’ll follow along.” Co-leading a trip seemed WAY out of my element, and I warned my leader so many times that I didn’t know what I was doing, but I said yes. I learned so much over the next couple months. I led group discussions, I prepped and planned, and my mind was always running with Cambodia and thoughts of bringing a team there. During the span between my two trips, I again started feeling restless. I turned 30, which caused me to start thinking about my life and what I was doing with it. I realized I was too comfortable. I had everything I needed- a job, an apartment, friends and family close by, money, a car, everything within my fingertips. I realized I didn’t need God when I had everything that I thought I needed. My thoughts kept going back to long term missions and that the Lord was calling me there, but I felt so uneasy and scared. I was in the car driving somewhere when I just started praying, “Lord, I want to follow Your will for me, what is it that’s holding me back? Why am I so resistant to doing long term missions?” God then placed in my heart that it was because of my twin sister. I have done everything with my twin sister. We went through all of our schooling together and had been working at the same hospital on the same floor until then. She was the person I didn’t go a day without talking to. I realized I didn’t want to leave her. But that meant I was putting her ahead of God. She was my idol. I broke down crying with this realization. At this moment I prayed to God, “I give my life to you. Whatever you want me to do, I will do.” I was tired of feeling comfortable and complacent. I wanted to be stretched and pushed everyday. I wanted to need God. I wanted to be obedient to God. Since that day I knew I would be doing long term missions, but I didn’t know where I would be going or with who I would be going with. I told God He better make it loud and clear, because I’m doing all of this blindly. A few weeks later, I heard about the M3 Mobilizing Medical Missions Conference. I immediately cleared my schedule and made plans to go. It was a two day event, and the first day I knew I was exactly where I was supposed to be. Listening to these missionaries share their story and speak about their journey was all the confirmation I needed. I took notes like crazy, not wanting to miss a word they spoke. The second day filled me with so much richness and hope for what the future held. As the day started to wind down, I got worried. What if I didn’t find where I was supposed to go? Then where would I look? I had tears in my eyes as I said a prayer to God. “Dear God, please reveal to me where You want me to go.” It was a prayer of desperation. The very next booth I stopped at was Mission of Hope: Haiti. I saw a pamphlet that read, “Long Term Medical Missions.” I immediately knew this is where I was going. They talked to me a little about it, but then told me to go home and pray about it. I remember calling my sister on the way home telling her that I would go to Haiti. I felt on top of the world. God had answered my prayer and revealed to me where I was going! As scary as it seemed to be going to a country I hadn’t been to before, not knowing what I would be doing, and not having anyone there that I knew, I was at complete peace. That’s how I knew this was God’s will. God is the Prince of Peace, and all decisions made through Him will have peace accompany it. They sent me over to Haiti for 5 weeks to learn my position and make sure this is where I was supposed to be. These 5 weeks were super challenging for me. I felt like a new nurse all over again. I couldn’t seem to learn my job. I was frustrated trying and failing to learn the language. It felt like everyone knew each other and were friends, and I was all by myself. The days were so long, and I felt like I never got a break. Through all this though, I never once doubted this is where I was supposed to be. I was pushed and challenged. I grew tremendously in my faith. I saw God move in big ways. I felt God’s presence in and around me. The community here poured so much love into me. So by the end of 5 weeks, I didn’t want to leave, but I knew I would be back. A month later, after quitting my job of 8 years and moving out of my apartment of 4 years, I was back in the country that had captured my heart. Now reaching a year after having come here, I’m more thankful than ever that I got the calling to come here. I’m thankful that God knew what I wanted more than I did. I’m thankful He didn’t give me the things that I thought I had wanted at the time. This year was filled with some of the hardest moments of my life and some of the best moments. I would rather experience the hardest moments in Haiti than the best moments in America. I have learned so much about nursing. I have grown in my faith. I have pushed myself mentally, emotionally, and spiritually. My role is medical missions coordinator. I lead medical teams to mobile clinics in the surrounding villages of Haiti. I’m in the unique position that I get to pour into the team members that come in each week and the Haitians we work with everyday. I get to share my story with all of them and I get to hear their stories. I get to see God use them just like He is using me. I really do get to go on a mission trip each week. Haiti is such a beautiful country in so many ways. I have fallen in love with the people and their strength and their joy in the little things. I’ve fallen in love with the simplicity of Haiti and the beautiful mountains and water. I’m thankful that God picked an ordinary person like me to be His hands and feet. Everything that I’ve done here is because of Him. He has given me the skills and knowledge I need to do this job, and I give Him all the glory. Now as I end this year and start year two, I’m so excited to see where God leads me. Doing God’s will and knowing you’re exactly where you’re supposed to be is the best place to be.